This is an upgrade to superior comfort, performance and versatility. underwater use, OCEAN REEF is now recognized worldwide as ―THE FULL FACE MASK COMPANY, wherever you dive. 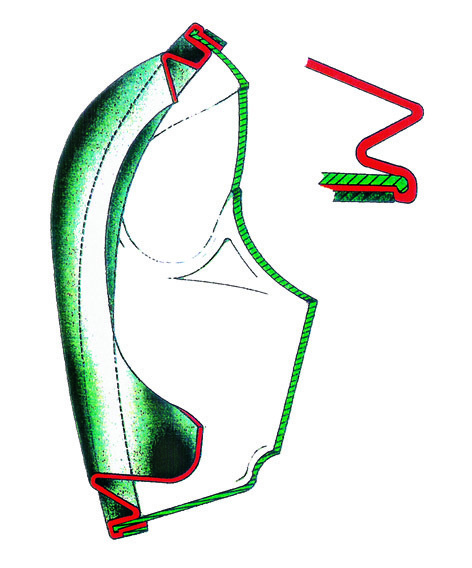 The patented bellows-type skirt with a “spring profile” has a large sealing surface (30-45 mm, doubl e that of a conventional mask). The spring effect is achieved by a combination of the double “S” section and the inner support ribs, resulting in a comfortable fit and ample support. This allows the mask to “float” comfortably on the face. The face seal and strap concepts are OCEAN REEF patents. The majority of the models may be supplied with two sizes: Small/Medium and Medium/Large. In order to determine whether a diver should wear a S/M or M/L mask, OCEAN REEF has designed a Mask Measuring Kit (code 33075). The sizing and measuring system were designed in accordance with the official measuring procedure used in the Los Alamos Scientific Laboratory Charts at the SBCCOM Mask Fit Facility-Aberdeen Proving Ground (Maryland, USA). 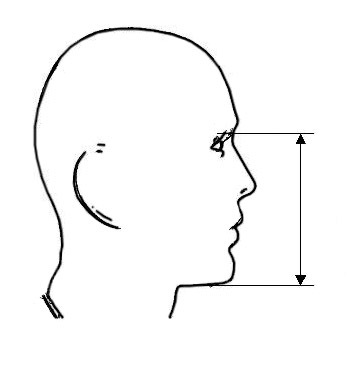 Before purchasing a mask, use the caliper to take two simple face measurements. Using the Full Face Mask Size Recommendation Chart, it is possible to evaluate the size category into which the measurements fall. 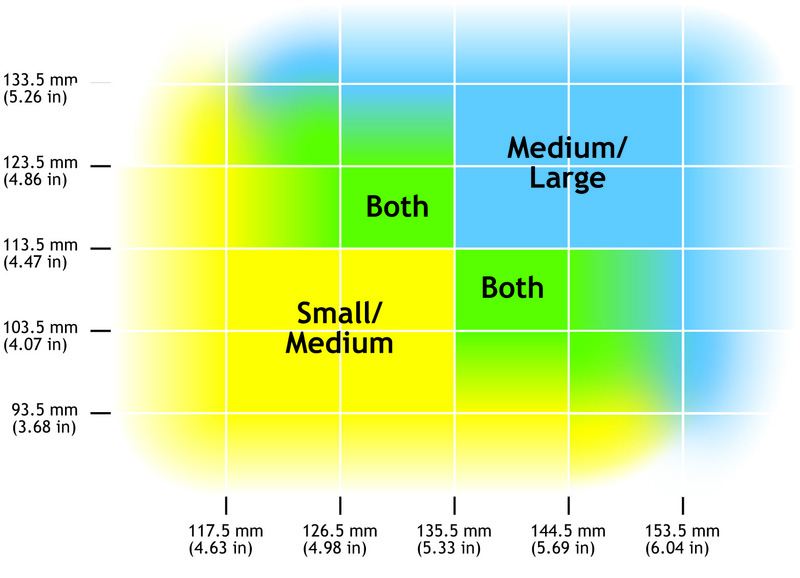 There are three different size categories on the chart: Small/Medium, Both, and Medium/Large. If the measurements fall within the both category, then the customer should technically be able to wear either size (MEDIUM/LARGE or SMALL/MEDIUM), and in that case they should try on a mask to select the best fit. Please note that the chart boundaries fade. 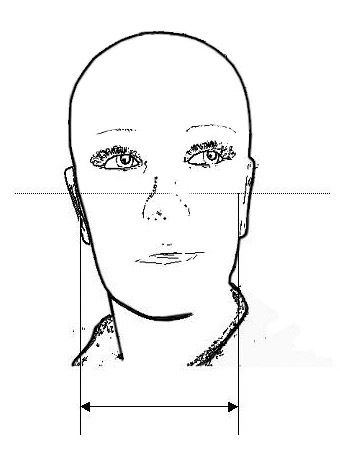 The fading areas represent less common face measurements. It is very likely that a mask will still fit comfortably even if measurements are located in these fading areas. The Neptune Space visor is made of transparent polycarbonate. It is designed to be wider and sit closer to the face than previous full face masks. This design maximizes the visual field, particularly the peripheral area. The visible light transfer of the visor is 92%. Required field of vision (effective) >40% of the natural field of vision – Space masks 71.80%. The insert photos show the visual field of the Neptune Space compared with two competitor’s full face masks. The visor of the Neptune Space can resist the impact of a 6.35 mm steel ball traveling at speeds of 540 kph (335 mph). 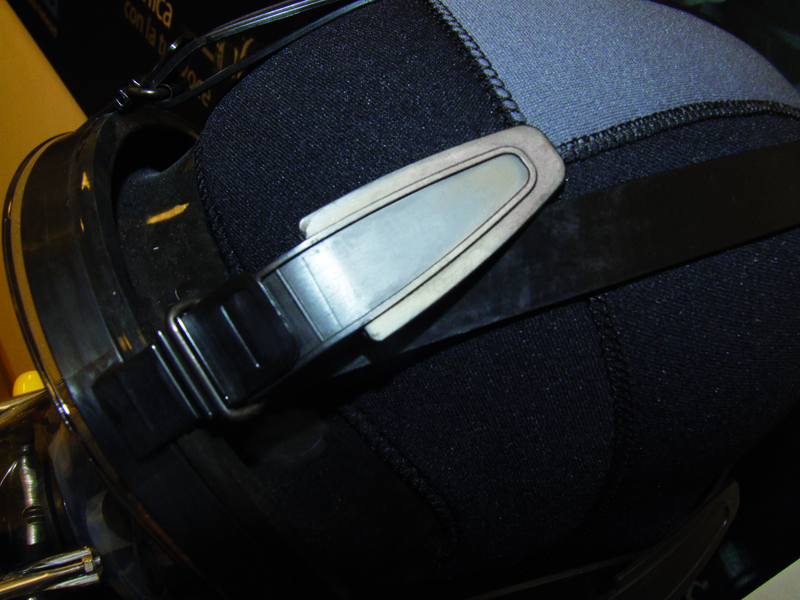 The visor is coated on both sides with a siloxane resin to increase the scratching and chemical resistance. Tested by STANAG 4296 = resistance to the impact of a 325mg metal fragment with a speed of 240 m/s and Impact resistance test: 39.3 mm/254 g sphere from 1300 mm, no cracking or added protection during transport, the Neptune Space comes with a removable protective shield (to be removed before diving). grasp while wearing neoprene gloves. The FRB II (Raptor and Space Fast Rotating Buckle) allows the mask to be donned and doffed quickly. Predator and IRON MASK use an AISI 316 stainless steel with surface electric treatment and AISI 316 stainless steel rollers.